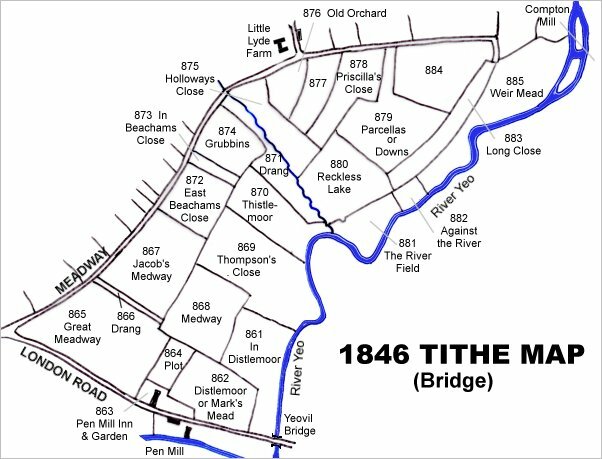 The southern part of today's Lyde Road was originally known as Meadway, Mead Way or Medway and is noted as such in the Terrier of 1589 ".... from Meadway Gate, the lower part of the way, unto Reckless Gate...." and ".... from Reckless Lake in the outpart of the Meadway unto the River before Compton Mill....". A lease dated 4 April 1673 between Sir William Stourton and Edward Jacob the Elder of Kingston, Gent, refers to ".... in the Manor of Kingston, also 1 close meadow or pasture Meadway 7a." 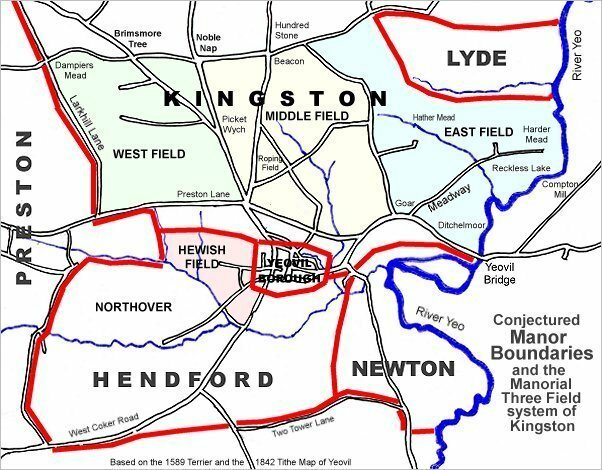 In 1754 it was referred to in a document as "Master George Prowse's Mead-Way" - George Prowse being the Lord of Kingston Manor at that time. 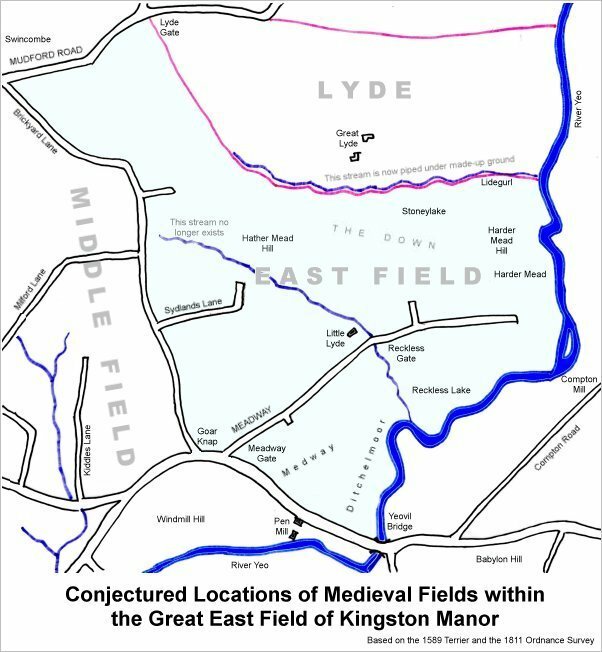 On the corner of Meadway (today's Lyde Road) and London Road (today's Sherborne Road) was a large field that had once been part of the great Medieval East Field of Kingston Manor. This field was called Meadway, or Medway, and in today's terms stretched along Lyde Road from the junction with Sherborne Road as far as the Lidl store and stretched along Sherborne Road from the junction with Lyde Road to beyond the railway line. By the time of the 1743 Terrier, Meadway (the field) had been broken up into several smaller fields, or parcels. The farthest east of these was still known as Medway (Parcel 868). In his will of 1828 William Row referred to "my Close of Meadow Ground called New Close or Meadway also bought of the Heirs at Law of my said uncle containing eight acres more or less". 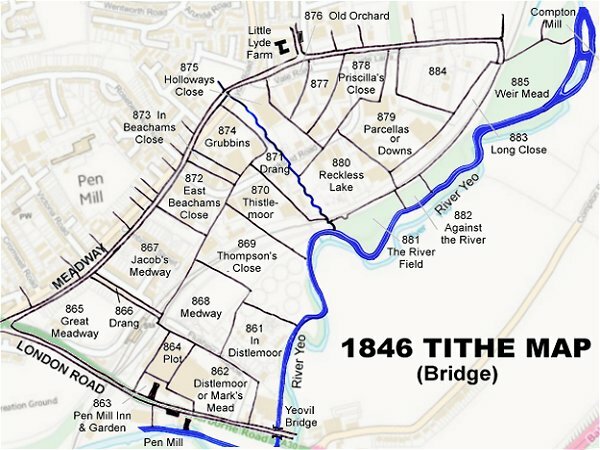 The 1846 Tithe Apportionment noted that Medway was owned by John Tanner Whitely Pitcher and the tenant was John Brooks Jnr. The Apportionment noted that it was used as meadow and measured 6a 2r 0p. Medway was accessed from Meadway (the road) via Drang (Parcel 866) also owned and occupied by Pitcher and Brooks. Medway was bounded on the northwest by Jacob's Medway (Parcel 867), on the southwest by Great Medway (Parcel 865), Plot (Parcel 864) and Markes Mead (Parcel 862), on the southeast by Distlemoor (Parcel 861) and on the northeast by Thompson's Close (Parcel 869). Today the former Medway is occupied by the eastern part of the Yeovil sewage works, northeast of Flushing Meadow.